This is the one that put RJD2 on the map with his first official full length on Def Jux! 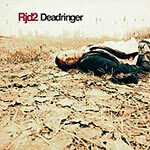 Re-released in 2009 on RJ's own imprint after acquiring the rights back to his music before Def Jux folded. This album was produced, arranged and performed by RJD2, except where noted. B1 features Blueprint. C1 features Jakki. D3 features Copywrite.